On the outskirts of Siem Reap in north-western Cambodia lies Angkor, the capital of an ancient and powerful Khmer Empire. Lost to civilisation for hundreds of years, it has now been restored to glory as one the world’s greatest historical and architectural wonders. Angkor is in every sense an incredible place with an incredible story. Just one warning: Once you have visited this awesome ancient complex, it will be hard to find anything that quite compares. Many temples and ruins make up the Angkor Archeological Park. It is worth bearing in mind that how much you see of the park is directly proportional to how much time and stamina you have. It spans an enormous 400km², and there is a lot to be mesmerized by within that space. It may have been populated by up to a million people at its height between the 9th and 15th centuries. Angkor Wat is its most famous and preserved legacy, but those five decorative peaks are just one landmark in a whole city of exquisite historical sites. You can purchase different passes for the park, so the first decision will be in selecting your ticket. A day pass will allow you one glorious day scratching the surface, three days will give you a much better chance of getting around the majority, and a week will give you the time to pace yourself and get around most of it without succumbing to exhaustion. Me, my sister and our travelling companion opted for the 3 day pass, which also included an additional entry to scramble up to the Phnom Bakheng temple with the hoards to watch the sunset. The next issue is how to get around, as there are a number of options. These range from walking (for those who might be exceptionally energetic or gluttons for punishment), to the lavishness of elephant rides and hot air-balloons. After some discussions, and a big frown from my sister that ruled out cycling, we choose to hire a Tuk Tuk with a driver. At $12 US per day (unless going to the outer temples) between three, this was really nothing to be chauffeur driven to where we wanted, all be it in a rickety little Tuk Tuk pulled by a motorbike that had seen better days. Angkor Wat of course. The most famous and most preserved, so arguably the most spectacular. It was never entirely abandoned as the others were. In 1431 the Siamese (from modern day Thailand) defeated the Khmer Empire and laid siege to the city of Angkor. Inhabitants were forced to flee, and the city was thrown into a period of abandonment and consumed by the Cambodian jungle, until the French explorer and naturalist Henri Mouhot ‘rediscovered’ the temples in the nineteenth century, bringing them to the world’s attention and beginning their rescue from the grips of the jungle. However, monks had taken residence in Angkor Wat, and although the temple has suffered the test of time, and was certainly not overlooked by the looters who left just about every statue they could find headless, it was at least spared from the destructive forces of the jungle and of being forgotten. We took up the services of a local guide at Angkor Wat, who we found to be extremely articulate and informative. He gave us some fascinating and enlightening information, which greatly aided our understanding and appreciation of this, as well as the other temples. You can also buy some really good books on site. There will be an opportunity to purchase one every five minutes don’t worry about that. Angkor Wat is in fact a mausoleum built by King Suryavaman II in the 12th century. As many of the temples, it was originally Hindu but later realigned with Buddhism. It is believed to be a representation of the spatial universe according to our guide. The central complex with its five peaked towers represents Mount Meru, the home of the gods and the centre of the universe. Surrounding this are the continents (the lower courtyards) and the ocean (the moat), and the bridge across it is symbolically the crossing between the human world and the godly world. Where they are still in good condition, the intricate carvings on the walls are like story boards telling ancients myths and legends. Our guide told us so many interesting facts and stories, by the time we walked over the Rainbow Bridge back into the human world, we were utterly spellbound by the place. Bringing us back to reality, it seems appropriate to point out that you should be prepared for the heat, the tourists, and also the children! They are waiting to accost you the second you disembark your transport. They have an answer for just about everything you might say to persuade them that you don’t really want to buy another bracelet, and they will remember you if you say “maybe later”. My sister ended up buying not one, but three, drinks she didn’t want on the way out of one temple. We had books, postcards, you name it. It is very hard to say no. But unfortunately, you can’t say yes to everyone. Back to the Tuk Tuk and off to another highlight for me in the city of Angkor Thom. 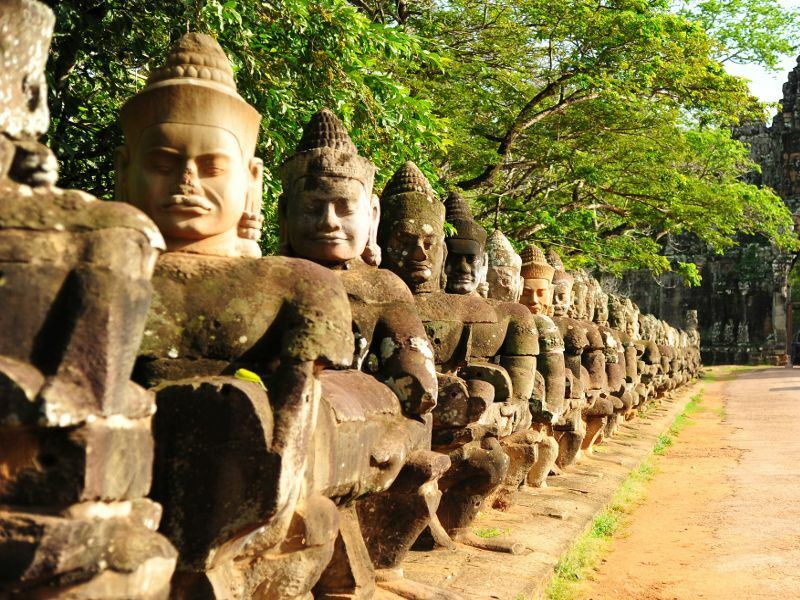 Angkor Thom is 10km² and was established by King Jayavarman VII. I will never forget entering through those immense city gates. There is so much to see within these walls, you could spend an entire three days just here. Presiding over it at its centre is Bayon, the state temple. A Buddhist temple built in the late 12th century, its towers are carved into 216 faces they believe to be of Avalokiteshvara, or the Bodhisattva of compassion, although they apparently bare an uncanny likeness to the modest King Jayavarman himself. On every corner of every tower of the building is this whimsical, all-knowing smile following you wherever you go, still smiling out from the weathered stone after hundreds of years. You can’t help but smile back. Ta Prohm is another favourite of mine and I should think every budding photographer’s. It is situated about a kilometer from Angkor Thom. Many of the fig and cotton trees, which have taken over and consumed the temple, still hold it in their clutches. It really demonstrates the destructive power of the jungle. Ta Prohm is tragically beautiful in its ruinous state. All cameras were permanently clicking as we all tried to capture those coveted, atmospheric images of this famous Angkor temple. Bantey Srei was my favourite of the Rolous group. A 10th century Hindu temple dedicated to Shiva, it has some of the most beautiful and intricate carving in the park and indeed on earth. Built from red sandstone, it has this lovely pinkish hue. It was really absolutely beautiful. We must have spent hours studying all the detail, because I seem to remember when we got back to our Tuk Tuk our driver was fast asleep. On our last morning we woke up to watch the last sunrise of the year come up over Angkor Wat. Despite the masses who jostled for position around the lake that morning, it was truly a wonderful sight and worth the early morning. The remainder of our last day was spent trying to soak up as much as we could before we ran out of time, reached sight-seeing saturation point and my sister looked at me wearily and said ‘No more temples. I am templed-out’. We had seen so many incredible temples and ruins and had walked miles. After three days we were definitely all templed-out, but it had been fantastic. One of the things I found most effecting about my visit here was the people of Cambodia. The young children selling souvenirs, the UXO (unexploded ordinance) victims in Siem Reap and the thin shaven headed monks entreating you to give alms in all the temples. 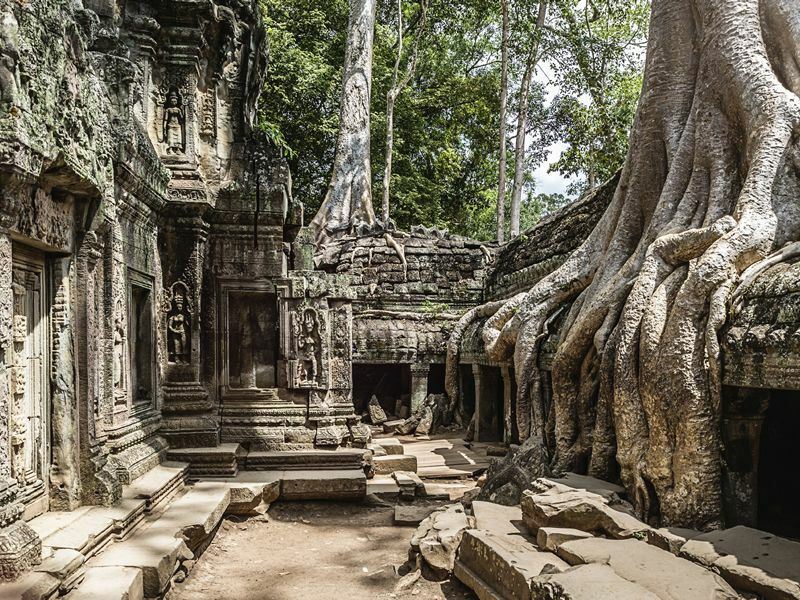 The Angkorian age was truly one of power and prosperity, but in contrast, modern day Cambodia is still struggling to recover from the hardships they have suffered since. Our guide told us it is a misconception that everyone forgot about Angkor. Cambodians never forgot about their incredible heritage and these amazing buildings and temples. Sadly, a country in turmoil was forced to abandon them. So Angkor was never truly forgotten. And I know that I will certainly never forget it. More information and to book: Our Wonders of Vietnam, Mekong and Cambodia tour showcases the best of south-east Asia with everything from gorgeous natural beauty and bustling cities, to ancient sites and poignant memorials.